An Israeli central court in Beersheba on Wednesday rejected an appeal against a decision to demolish a Palestinian Bedouin village in the Negev, even though the structures were built after residents were forcibly moved there by Israel decades ago. The Israeli court's decision paves the way for the planned displacement of Umm al-Heiran's 1,000 inhabitants to make way for a planned Jewish town, 50 years after the state gave the village inhabitants' the land after their original lands were confiscated. The judge rejected an appeal filed by Adalah, the Legal Center for Arab Minority Rights, on behalf of residents against a court decision to demolish 33 buildings in the village. The judge reportedly accepted the defense's argument that despite the land ownership, and the fact that Israel moved residents there but refused to ever recognize the village, the buildings themselves were still considered unlicensed and thus should be demolished. The judge did however decide to delay the demolitions for nine months in order to give residents enough time to find new homes. Since the original demolition order for the village was issued in 2003, villagers have been fighting a legal battle with Adalah's help to prevent the order's enforcement. Israeli authorities originally announced plans to demolish the Arab village of Umm al-Heiran in order to create a Jewish town atop it, to be named Hiran, Adalah lawyer Suhad Bishara told AFP in December. 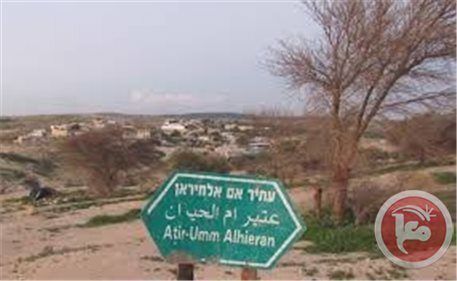 The Palestinian Bedouin residents of Umm al-Heiran moved to live in the village in 1956 after the state of Israel confiscated their lands in Khirbet Zabbala. However, the state never recognized the village's existence, neither providing services nor granting licenses for the buildings they constructed. In 2002, the Israeli government prepared blueprints for a new Jewish city named Hiran to be built on the lands. The government also planned to establish a forest named Yatir on the adjacent Bedouin village of Atteir, which is also subject to demolition proceedings. Israel refuses to recognize 35 Bedouin villages in the Negev, which collectively house nearly 90,000 people. The Israeli state denies them access to basic services and infrastructure, such as electricity and running water, and refuses to place them under municipal jurisdiction. Although the majority of Palestinians were expelled from their homes inside Israel during the 1948 conflict that led to the creation of the State of Israel, some Palestinians managed to remain in their villages and their descendants today make up around 20 percent of Israel's population. Israeli occupation authorities, on Thursday morning, served four demolition orders for infrastructure projects in the Palestinian village of Khirbat al-Tawil, to the south of the West Bank city of Nablus. Activist Hamza Diriya (Resistance Against the Separation Wall and Settlement Committee), said that Israeli administration personnel, accompanied with military patrols, came to Khirbat al-Tawil in the morning, handing residents demolition orders for power lines and a water reservoir. Diriya explained that the orders include the demolition of the power network which was funded by the Belgian government in 2007 with $200,000, Al Ray reports. Also included is the demolition of a water network and pipes linking houses, agricultural facilities and fields, as well as the demolition of a well which gathers water, owned by a Palestinian farmer, and a power pole. Diriya confirmed that the occupation is trying to create instability in Khirbat al-Tawil and to displace the inhabitants after the demolitions, which have been repeated many times throughout the past five years. A horde of Jewish settlers from Ro'i settlement appropriated more than 300 dunums of Palestinian-owned agricultural land in Samra area of the Jordan Valley, according to local sources. Municipal chief in the Jordan Valley Aref Daraghmeh told Quds Press that the settlers embarked on setting up a fence around the land they seized in Samra area and establishing roads. 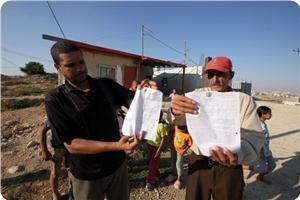 Daraghmeh added that the settlers brought 30 portable toilets to the seized area. The settlers claimed that they plan to organize a party in the area, but local sources affirmed that such claim is refuted by the systematic Israeli annexation of large tracts of Palestinian land in the Jordan Valley. The seized land belongs to more than 45 Palestinian families living in the Jordan Valley and being prevented from utilizing it for housing or agricultural purposes at the pretext of military drills or over claims that it is part of a closed military zone. The Israeli occupation authority (IOA) started to build a huge Jewish archeological center over 35 dunums of Palestinian lands in occupied Jerusalem, according to Maariv newspaper on Wednesday. The newspaper stated that this center would include a library and a museum to display alleged ancient artifacts and scrolls. 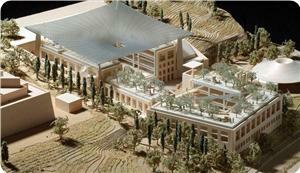 The new archaeological center is being built next to the Israel museum and will eventually serve as the Israeli antiquity authority's headquarters. Some 80 million dollars, mostly private funds, have been earmarked for the project, provided by some 30 donors from the US, Europe and Israel. The Israel Antiquities Authority has destroyed several ancient archeological sites and antiquities as a result of a controversial dig in the Palestinian neighborhood of Silwan in East Jerusalem, the Al-Aqsa Foundation for Endowment and Heritage said Tuesday. 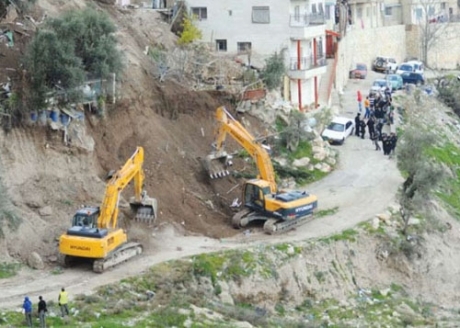 The authority recently began the final stage of archaeological excavations at the site, which is located in the Wadi Silweh area only 20 meters from the walls of the Old City, the foundation said in a statement on Tuesday. As a result of the excavations, several ancient Islamic archeological sites and antiquities have been destroyed, including a cemetery that dated back to the Abbasid caliphate. Additionally, the dig has damaged relics that date back to the Jebusite Canaanite era in the second millenium BC, the Al-Aqsa foundation alleged. The excavations are the continuation of an Israeli project to build a biblical park in the area alongside the City of David archaeological park, and will feature a "museum of Jewish history" and a "Jewish national park." The excavation site measures around six dunams (1.5 acres) and runs 20 meters deep in some places. The excavations are connected by a network of tunnels that "the Israeli occupation has been digging under and around Al-Aqsa Mosque," the statement said, pointing out that the third-holiest site in Islam is located only 100 meters from the site itself. The foundation said that the Ir David Foundation -- commonly known as Elad -- is funding the excavations as part of a plan to build a seven-story building which will serve as a Jewish cultural center. The excavation site is located on what used to be private Palestinian land owned by the Siyam family from Silwan. The land was confiscated by Israeli authorities for the dig. Israel frequently permits excavations and archaeological digs in East Jerusalem, specifically around the Al-Aqsa mosque and in the Silwan neighborhood, that threaten the structural integrity of Palestinian homes and holy sites in the area. Critics charge that the digs search for ancient Jewish ruins at the expense of existing homes, and that Israeli archaeologists often ignore and even damage non-Jewish artifacts. In 1967, Israel demolished the 800-year-old Moroccan Quarter of Jerusalem, displacing 650 Palestinians and destroying numerous mosques, homes, and holy sites, in order to build a plaza in front of the Western Wall. Israel also evicted around 6,000 Palestinians from nearby areas in order to massively expand the city's historical Jewish Quarter. Israeli Occupation Forces (IOF) demolished Wednesday morning three homes in Beit Hanina neighborhood in occupied Jerusalem under the pretext of being built without permit. Eyewitnesses said that Israeli bulldozers raided at the early morning hours Ashqariyeh neighborhood in Beit Hanina and started demolishing two caravans and sheds belonging to Shadi Samara family. The sources added that Israeli soldiers brutally attacked a group of Palestinians who gathered near the demolished homes, injuring a number of them. Meanwhile, Israeli bulldozers demolished another home belonging to Badwan Salaima in Beit Hanina under the pretext of being built without construction permit. It was established a year ago on the ruins of his parents' home that was also demolished for the same reason. 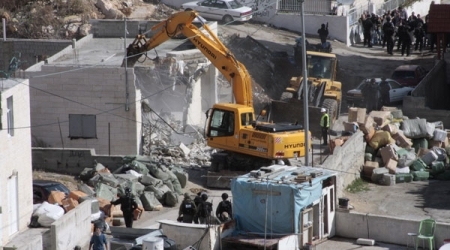 Bulldozers of the all-Israeli West Jerusalem municipality demolished on Wednesday a house belonging to a Palestinian resident in the East Jerusalem neighborhood of Beit Hanina under the pretext it was constructed without a permit, according to local sources and witnesses. Witnesses told WAFA that the municipality bulldozers, backed by large police forces, arrived in the early morning hours, imposed a tight military cordon on the house and proceeded to demolish the house of Badwan Salaymeh, 53, leaving him and his family homeless. This is the second time forces had demolished Salaymeh’s house; forces previously demolished his house under the same pretext, forcing him to build a residential shed on the ruins of the previous house, which was demolished in May of the last year, to shelter him and his family. To be noted, the Israeli municipality of West Jerusalem rarely issues construction permits to the Palestinian residents in Jerusalem and imposes skyrocketing fees in case a permit is issued. To be noted, a building permit is not required to build a shed. 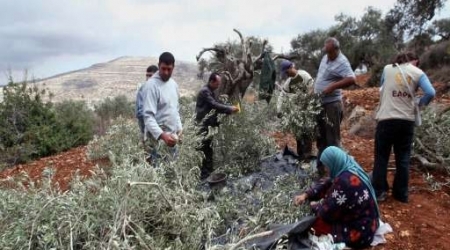 Israeli settlers Sunday destroyed Palestinian-owned olive trees after spraying them with toxic chemicals in the village of Jalud to the south of Nablus, according to activist Ghassan Daghlas who monitors settlement activities in the northern West Bank. He said settlers from Esh Kodesh settlement, built illegally on the land of Jalud, sprayed and killed about 55 olive trees, belonging to two residents in the village, with deadly chemicals. Israeli occupation authorities intend to seize 100 dunoms of land in Hares village in Salfit governorate in favor of Revava settlement. Council of the village said that it obtained a master plan for the new settlement, published by Israeli newspapers, where the occupation intends to seize 100 dunoms. The council called the citizens who have those lands to prepare the necessary papers that include inventory inheritance to submit objection over this decision. The lawyer who is specialized in settlement affairs will follow up this case. Hares village and Salfit town are witnessing a massive settlement campaign where Ariel, the largest settlement in the occupied West Bank, is located. On arriving at the village, the demonstrators parked on the opposite hill and made their way through the valley to the settlers’ encampment. The settlers were armed with automatic hand guns, assault rifles, and dogs to protect the illegal camp. Resistors confronted the settlers in a non-violent way while settlers took photographs on the phones of all the protestors. After a short time a settler armed with a machine gun and dressed in black with his face covered climbed a wall and started to insult a Palestinian activist, stating that he would kill other Palestinians. The activist responded with in a raised voice matching his righteous indignation at the Zionist’s hateful comments. The army soon arrived and attempted to move the protestors from the construction area. On many occasions the leader of the settlers took the soldiers to one side to make suggestions. A proposal was made that, if the settlers camp is dismantled, the protestors can leave and take the matter up in court, but this was dismissed. Soon a high ranking military officer arrived and was presented with ownership papers from a villager which date back 130 years. The officer told him that the settlers had ownership papers too (presumably not quite so old!). Meanwhile the settler, with his face concealed, had made his way across to the Palestinians’ cars with his aggressive dog following. A small group made their way across to stop him damaging the vehicles. On seeing the Palestinians approach, the settler made his way down to a taxi driver, that was waiting to drive the ISM team back to Hebron. 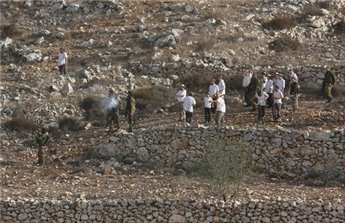 The Palestinians feared that the settler would attack the taxi driver, so the group drove down the hill to support him. The armed settler then made his way back to the constructions site. Sometime later the Israeli police arrived and arrested the activist who had argued with the Zionist armed settler, who had complained that he was physically attacked. The Palestinian went with the Police peacefully and was later arrested and charged with the assault. Activists exchanged video evidence and the prisoner was released on bail with a payment of 2000NIS. We await a trial date. Arab ar Rashyaida is extremely vulnerable to occupation by settlers. The land surrounding the village is designated as “Intended Nature Reserve” under the Oslo Interim Agreement, and as such is under full Israeli control. The strategy of building outposts on Palestinian land as a seed to develop illegal settlements is well established and supported by the Israeli authorities, despite the fact that it breaks International Law and the 4th Geneva Convention. Israeli settlers on Sunday plowed land and performed religious rituals on lands recently confiscated from the nearby Palestinian villages of Deir Istiya and Haris in the northern West Bank. Witnesses said that bulldozers from the Revava settlement northwest of Salfit plowed the lands in order to expand the settlement. Settlers also entered the lands around Haris village and performed religious rituals on lands that were confiscated from Palestinian villagers by the army on Saturday. On Saturday, Israeli forces notified the village council that they would confiscate 100 dunams (25 acres) of the village's private land. Witnesses added that the settlers have continuously seized lands from the villages of Haris and Deir Istiya in order to expand their settlement. Researcher Khalid Maali said that Revava -- one of 23 settlements in the Salfit district -- was established in 1991 on lands belonging to Deir Istiya, Haris, and Qarawat Bani Hassan. More than 500,000 Israeli settlers live in settlements across the West Bank and East Jerusalem, in contravention of international law. The main street in the neighborhood of Wadi Hilweh in Silwan, in occupied Jerusalem, witnessed on Friday landslides and cracks, after heavy rainfall that has continued for several days. 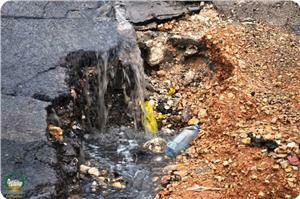 The Information Center of Wadi Hilweh stated in a press release that the rain dug a deep hole of two meters diameter and caused cracks in the main street, posing a threat to the lives of the residents and the passers-by. Residents of Silwan said the hole has uncovered a new tunnel drilled in the region, down the Wadi Hilweh neighborhood. The information center added that a retaining wall collapsed in the region, while more than 20 trees, including cypress and olive trees, were uprooted during the last two days. Another retaining wall had collapsed late last month, due to the Israeli excavations under the citizens' houses. Residents of Wadi Hilweh held the occupation municipality responsible for the collapses and landslides near their houses, as it has been stalling in repairing the recent collapses. The Israeli civil administration delivered a notice to a Palestinian village in the central West Bank declaring plans to confiscate parts of village's land, a local council said Saturday. 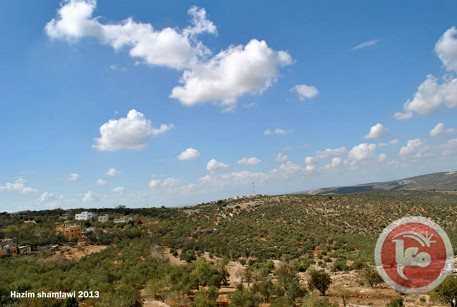 The village council of the town of Haris in the Salfit district said in a statement that Israel had sent a notice saying it would confiscate 100 dunams (25 acres) of the village's private land. The land, to be taken from northwestern Haris, will be used to expand the illegal Israeli settlement of Revava, the statement said. The statement urged landowners in the village to prepare ownership documents for a lawyer who will file a demurrer against the Israeli decision. The Revava settlement is one of 23 settlements in the Salfit district. It was built in 1991 when Israel confiscated land from Deir Istiya's farmers. The Israeli occupation authority (IOA) intends to annex more than 100 dunums of Palestinian-owned land in Hares village, north of Salfit city, in order to expand Revava settlement. The municipal council in Hares village said that it received from the Israeli army's civil administration a new structural plan for the village, which illustrates Israel's intention to seize more than 100 dunums of its land. The village council stated that the land, which Israel intends to confiscate, is located in the northwest of the village and near Revava settlement. The council called on the Palestinian villagers whose lands are located in the targeted area to bring all documents that prove their ownership of the lands threatened with annexation in order to fight a legal battle with the IOA. Israeli bulldozers early Wednesday demolished a residential building, a car wash, and a shop in an East Jerusalem village, a popular committee spokesman said. Hani Halabiyya, a spokesman for East Jerusalem's popular resistance committees, told Ma'an that a large number of Israeli troops and military vehicles raided the Jabal al-Baba area of al-Eizariya village early Wednesday. Bulldozers then proceeded to demolish a house owned by Suleiman Jahalin, a blind man who says he has been living in the Jabal al-Baba area since 1967. Before starting the demolition, Israeli troops forcefully removed Jahalin and ten of his family members from their home, he told Ma'an. After the 65-square-meter house was demolished, Jahalin expressed his intention to remain in the village. "The last thing I saw before I became blind was the land of al-Eizariya," Jahalin said. "I will never leave this land." He said he had recently received a demolition warrant from Israeli authorities. 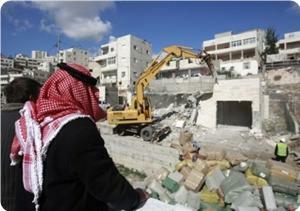 Meanwhile, Israeli bulldozers demolished a car wash and a grocery shop near the entrance of the neighborhood. The two structures were built on one dunam (1,000 square meters) of land owned by Sami Abu Ghaliya. Abu Ghaliya told Ma'an he was surprised to see Israeli forces surrounding the structures early Wednesday. They demolished the car wash and the shop without prior notice, he said. The same structures were demolished by the Israeli Civil Administration about a month ago, and Abu Ghaliya says he rebuilt them shortly after the demolition. Halabiyya said 40 Bedouin families could be displaced from Jabal al-Baba in the coming days, as all the families there had been issued demolition warrants. Additionally, he said, all the homes built in Jabal al-Baba -- which sits around 1,000 dunams (250 acres) of land -- are slated for demolition. 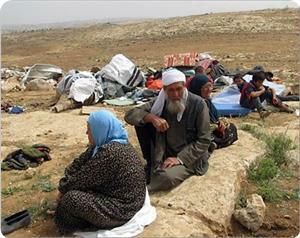 About 350 people living in steel structures and tents in the area could find themselves homeless, Halabiyya said. Angela Godfrey Goldstein, an advocacy officer of the Jahalin Association representing Palestinian Bedouin, condemned the demolitions. "As an Israeli I'm horrified that my country is demolishing possibilities for peace by displacing people continuously," Godfrey Goldstein said. "This home was on E1," she said. "One of Obama's red lines." She added that with peace talks ongoing, "this is hardly conducive to trust-building and reveals Israel's true colors." E1 is an area northeast of Jerusalem and west of the illegal Israeli settlement of Maale Adumim. Israeli plans for settlement construction in the area have been strongly opposed by the international community, including the US. Critics say Israeli settlement construction in E1 would divide the West Bank in two and make the creation of a contiguous Palestinian state -- as envisaged by the internationally backed two-state solution to the Palestinian-Israeli conflict -- virtually impossible. Israel rarely grants Palestinians permits to build in the West Bank, including East Jerusalem. It has demolished at least 27,000 Palestinian homes and structures since occupying the West Bank in 1967, according to the Israeli Committee Against House Demolitions. 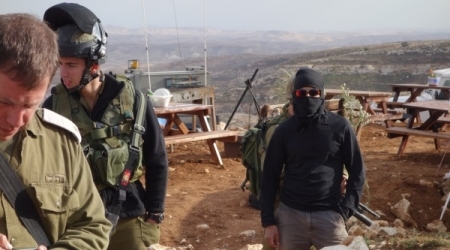 Israeli occupation forces (IOF) served notifications in Khirbat Al-Fakhit hamlet near Yatta town in Al-Khalil on Tuesday for the demolition of two water wells. Activist Ratib Al-Jabour told the PIC that IOF soldiers handed the notifications to two brothers in the hamlet. The soldiers claimed that the water wells were built without permit as they were located in area C, which is under full Israeli control according to the Oslo accords, Jabour added. More than 40 houses, schools and mosques in addition to 30 installations and sheep pens were served demolition notifications south of Al-Khalil since the beginning of this year. Israeli border police forces razed Araqib village in the Negev, occupied in 1948, for the 66th time on Wednesday morning. 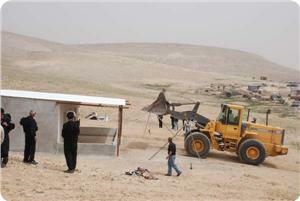 Police bulldozers razed homes and tents that were built anew on the land of the Bedouin village. Village inhabitants said that the border policemen attacked the village at dawn and forced them out in the heavy rain and razed their homes without allowing them to get their belongings out. The demolition came two days after special Israeli forces barged into the village and took photos of its cemetery in which the inhabitants usually take refuge during the Israeli repeated demolition of their homes.